80 days. Solanum lycopersicum. Open Pollinated. 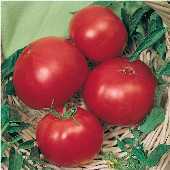 Plant produces high yields of 1 to 2 lb deep pink beefsteak tomatoes. They are sweet, tangy, juicy, and very flavorful. It has the rich full tomato flavor. Perfect for salads, slicing, and sandwiches. The plant has heavy cover that resists foliage diseases and blossom-end rot. It is an offspring of the popular heirloom Pink Ponderosa. A potato leaf variety. Excellent choice for home gardens. A heirloom variety dating back to 1924. Indeterminate. You know I originally gave this tomato a 4 stars rating, but I've change my opinion of the tomato and gave it 5 stars after taking several more off the plant. They weighed 1-1/4 to 1-1/2 pounds and were just as tasty as the smaller tomato. After eating several of the large tomatoes I now know the reason they call it Winner!!! I only planted one plant this year but next year I'll plant several more.